Save time and money by taking advantage of existing resources in a new way. 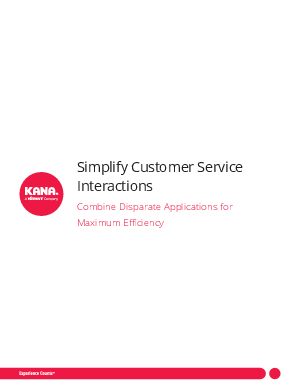 KANA offers a unified, omni channel desktop that allows you to transform your customer experience without the cost and complexity of rip and replace. The abundance of legacy applications in the contact center can trap a business into rigid, inefficient processes and introduce undue complexity. Over the years, mergers and acquisitions and new business units can clutter the IT infrastructure with redundant systems around billing, ERP, CRM and more. While the maintenance and usability headaches are nearly unbearable, the time and cost required to retire a mission-critical application is too daunting to undertake. So instead, CIOs find themselves stuck with dozens of disparate systems required to run their day-to-day contact center operations.